Bethlehem: City of David in Jerusalem. King David’s story runs from 1 Samuel 16 through 1 Kings 2. David wrote much of the book of Psalms and is also mentioned in Matthew 1:1, 6, 22, 43-45; Luke 1:32; Acts13:22; Romans 1:3; and Hebrews 11:32. Brothers – Eliab, Abinadab, Shammah, four unnamed others. Wives – Michal, Ahinoam, Abigail, Maacah, Haggith, Abital, Eglah, Bathsheba. Sons – Amnon, Daniel, Absalom, Adonijah, Shephatiah, Ithream, Shammua, Shobab, Nathan, Solomon, Ibhar, Elishua, Eliphelet, Nogah, Nepheg, Japhia, Elishama, Eliada, Eliphelet. We can learn a lot from the life of David. He was a man after God’s own heart (1 Samuel 13:13-14; Acts 13:22)! We are first introduced to David after Saul, at the insistence of the people, was made king (1 Samuel 8:5, 10:1). This choice of king, or even having an earthly king at all, was against the will of God, and although Saul was anointed by God through Samuel, he did not measure up as God’s king. While King Saul was making one mistake on top of another, God sent Samuel to find His chosen shepherd, David, the son of Jesse (1 Samuel 16:10, 13). David was believed to be 12-16 years of age when he was called in from tending his father’s sheep to be anointed as the true king of Israel. As soon as the anointing oil flowed down David’s head the Spirit of the Lord departed from King Saul (1 Samuel 16:14). The fact that evil spirits were tormenting Saul brought David into the king’s service (1 Samuel 16:21). Saul was pleased with young David, but this feeling vanished quickly as David rose in strength to slay the Philistine giant, Goliath, and win the overwhelming favor of the people (1 Samuel 17:45-51). The chant in the camp of Saul was taunting as the people sang out the praises of David and demeaned their king, causing a raging jealousy in Saul that never subsided (1 Samuel 18:7-8). If you or someone you know has eked his way through life amid strife, conflict and continuous battles, then you might understand how David lived and felt throughout his lifetime. Although Saul never stopped pursuing him with the intent to kill him, David never raised a hand against his king and God’s anointed (1 Samuel 19:12, 24:5-7). He did, however, raise up a mighty army and with power from God defeated everyone in his path, always asking God first for permission and instructions before going into battle (2 Samuel 5:22-23, 23:8-17). Throughout the life of David, God honored and rewarded this unconditional obedience of His servant and gave him success in everything he did (2 Samuel 8:6). David mourned King Saul’s death and put to death the one claiming responsibility for Saul’s death (2 Samuel 1:12-16). Only after Saul’s death was David anointed king over the house of Judah (2 Samuel 2:4), and even then he had to fight against the house of Saul before being anointed king over Israel at the age of thirty (2 Samuel 5:3-4). Now king, David conquered Jerusalem and became more and more powerful because the Lord Almighty was with him (2 Samuel 5:7). David was so enthralled with bringing the Ark of the Covenant to Jerusalem that he omitted some of God’s instructions on how to transport the Ark and who was to carry it. This resulted in the death of Uzzah who, amid all the celebrations, reached out to steady the Ark, and God struck him down and he died there beside it (2 Samuel 6:1-7). In fear of the Lord, David abandoned the moving of the Ark for three months and let it rest in the house of Obed-Edom (2 Samuel 6:11). After the Ark was in its rightful place, David decided to build a temple of the Lord around it (2 Samuel 6:17). Because of David’s bloody, battle-scarred record as well as his adulterous relationship with Bathsheba and the slaying of her husband, God denied his otherwise faithful servant the honor of building the temple, the house of the Lord (2 Samuel 6:5-14). This was surely a blow to David, but God assured him He would continue to make his name the greatest on the earth and forever establish the throne of David through David’s son, Solomon. Instead of being angry with God and having a pity party, David sat before the Lord, praising Him and thanking Him for all the many blessings he had received in his life (2 Samuel 7:18-29). David’s battles did not end with his kingship but continued with the surrounding nations and within his own household. Throughout the life of David, His sons connived and conspired to take control of the kingdom and they, as did Saul, threatened their own father’s life. And as with the death of Saul, David mourned the death of his beloved son Absalom, showing a passionate and forgiving heart (2 Samuel chapters 15-18). David’s broken heart and contrite spirit are what brought him the forgiveness of God and are what will bring him back to be the prince of Christ during Christ’s millennial reign. In 1 Chronicles 17:1, David’s thoughts turn to building a temple for the Lord. The king sent for the prophet Nathan and said, “Here I am, living in a house of cedar, while the ark of the covenant of the Lord is under a tent.” The discrepancy bothered David. Why should the king’s house be a palace, while the house of God was just a tent? At first, Nathan encouraged David to follow through on his desire to build a temple for the Lord (1 Chronicles 17:2). Yet that night the word of the Lord came to Nathan, changing their plans: “Go and tell my servant David, ‘This is what the Lord says: You are not the one to build me a house to dwell in’” (verse 4). God then points out that, in all the long history of the tabernacle, He never once rebuked Israel’s leaders for not building a permanent temple (verses 5–6). Rather than David building a temple, God decided to allow David’s son to oversee this work (verses 11–12). In response, David offered a prayer of praise: “You, Lord, are God! You have promised these good things to your servant. Now you have been pleased to bless the house of your servant, that it may continue forever in your sight; for you, Lord, have blessed it, and it will be blessed forever” (1 Chronicles 17:26–27). David considered God’s word as a tremendous blessing that affirmed his son would also serve as king. First Chronicles 22:8 sheds some light on God’s decision not to allow David to build the temple: “You have shed much blood and have fought many wars. You are not to build a house for my Name, because you have shed much blood on the earth in my sight.” David’s background of shedding blood in times of war was God’s reason for choosing David’s son instead (see also 1 Chronicles 28:3). God wanted a man of peace to construct the temple, not a man of war. His house was to be “a house of prayer for all nations” (Isaiah 56:7). Since David was forbidden from building the temple himself, he helped to gather materials and prepare the plans for the temple’s construction. He said to Solomon, “I have taken great pains to provide for the temple of the Lord a hundred thousand talents of gold, a million talents of silver, quantities of bronze and iron too great to be weighed, and wood and stone. And you may add to them. You have many workers: stonecutters, masons and carpenters, as well as those skilled in every kind of work in gold and silver, bronze and iron—craftsmen beyond number. Now begin the work, and the Lord be with you” (1 Chronicles 22:14–16). Solomon faithfully fulfilled this command during his reign, leading Israel to the height of world power. David’s desire to build a house for the Lord was noble, but God had other plans. David’s reaction to God’s nixing his plan is a model for us. When things do not go as we planned—when God closes a door—we should continue to praise the Lord and then move on in a new direction. Rather than complain about what we can’t do, we should do what we can, giving God the glory. As Christians who have trusted Christ as the only way to heaven (John 14:6), our battle with the giants in our lives will result in victory if we cling by faith to God and His power. The illustration of David and Goliath is only one of many examples of the supernatural power of our Lord. He cares deeply for His children and wants only our best. Sometimes that involves trials and battles, but these are ultimately for our good and His glory. James tells us to consider it pure joy when we encounter trials because they test our faith and develop patience and perseverance (James 1:2-4). When we are tested by these trials, we can, in the power of the Lord, stand up against any giant, trusting our Savior to win the victory. Some presume that David took five smooth stones instead of just one because he had some doubt. However, there is no indication in the story of David and Goliath that by picking up five smooth stones instead of one that David was doubting God. Rather, David was simply being prepared. What if the Philistines attacked him after he killed Goliath? How would he have defended himself? David was simply being prepared when he took the four additional stones. Also, he couldn’t have known that one stone would be enough to kill the giant. God had not promised that David would kill Goliath with the first stone. Father God, we ask for strength to stay the course in our lives through all our trials and tribulations. Stay faithful to You, Lord. Always abiding in faith in You. Teach us this day our daily bread, (Word). Let this study bring us closer to You for Your glory in our hearts, so we can have a heart like Yours. AMEN. 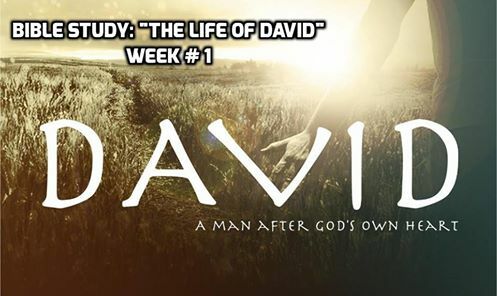 1. Who was David’s father? 2. Which prophet anointed David as king? 3. Which of these was not a wife of David? 7. Which of David’s sons tried to overthrow and kill him? In this study we will also read the book of Proverbs to self-examine ourselves for God’s work in our life, and as a prayer warrior to be strong in the Lord, and in the power of His might. David did! As I was reading through the study I found that in scripture (2 Samuel 15:13, 14), not only did Adonijah went against his father David, but Absalom did too (2 Samuel 3:4; I Kings 1:5; 2:13; I Chronicles 3:2). The Bible do say that in the last days “fathers and sons will be against one another,” so was they back then in Bible dates too, amen. We see it clearly!! “The father shall be divided against the son, and the son against the father; the mother against the daughter, and the daughter against the mother; the mother in law against her daughter in law, and the daughter in law against her mother in law.” (Luke 12:53) That is scriptural!